Some of the glass is not quite 100% but looks nice anyway. The holes are drilled towards the center like beads, laced onto a strech-type string. A clasp of some type could be added or just tied like shown. I made a necklace similar to this and with the glass colors the same it looks like a matching set. 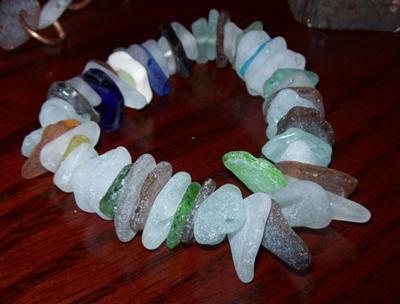 Could you please email me at lovingunity (at) gmail.com and tell me how to drill holes in Sea Glass. I would like to make buttons. What size drill bit, what kind, what kind of dremmel etc. Thanks, I appreciate it. If you haven't done it already, take a look at what others have suggested at our page "How to Drill Glass." Yep, the stretch string does work and any kind of a clasp added would dress it up. You could take it a step further and use durable beading string that doesn't break or stretch with crimp beads. Thanks so much for contributing your pic. Keep them coming; we love to look.